While we are all for biodiversity in Stanley Park, certain species are so undesirable that we take bold steps to keep them out of the Park. These are the “invasive” alien species and, if left alone, they are capable of causing substantial ecological and environmental damage. One of the invasive alien species we are trying to prevent from spreading is English ivy. After several years of working to stop or reduce the spread of ivy in Stanley Park, we are finally seeing results. The team of volunteers working with SPES’ Tree Ivy project is just about to complete a project that began in the spring of 2009 to remove English ivy encroaching on the trees in the Park. This program acts as a key conservation initiative as part of SPES’ invasive species management. When English ivy climbs trees and other structures, its form of growth changes and it begins to produce fruit. This fruit production is the main means by which ivy spreads to new habitats. To slow the dispersal of ivy in Stanley Park, it is important to eliminate the seed source. The group has set aside a particularly large tree along the seawall (photographed here) that is covered in a dense layer of ivy to tackle in their final session as they wrap-up the three-year project. Where will they go next? 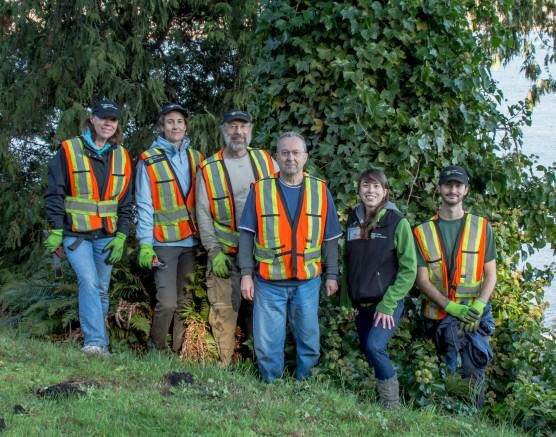 This group of hard-working and dedicated volunteers will refocus their energy to target the removal of newly emerging invasive species that have established in Stanley Park including yellow lamium and common periwinkle. For more information on getting involved with projects like this, visit our Volunteer Opportunities.